The art of the violin solo began coming into its own in the 17th century as this disc amply demonstrates. Biber's monumental Passacaglia is full of extravagant double stops and technical tricks that demonstrate how far advanced the art of solo playing already was. Schmelzer's lovely 'Sonata Quarta' is indeed quite subtly arranged by Elizabeth Wallfsich who is definitely one of the leading lights in period violin practise. Westhoff is under almost unknown composer but on the strengths of this impressive set of Suites, he was definitely one the prominent solo virtuosos of his age. Finally we have Nicola Matteis' works also arranged by Wallfisch, another impressive vehicle for the solo violin and greatly enhanced in these knowing transcriptions. 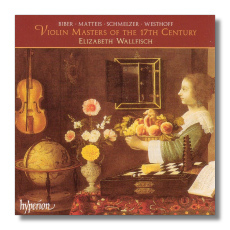 I cannot be more enthusiastic for such marvellous playing from Elizabeth Wallfisch who definitely continues to establish her already solid reputation as one of the violin virtuosos more conversant with the remote centuries. The Frankfurt based recording is exceptionally clear and the disc is a must for all those who are interested in the development of the violin as a solo instrument.